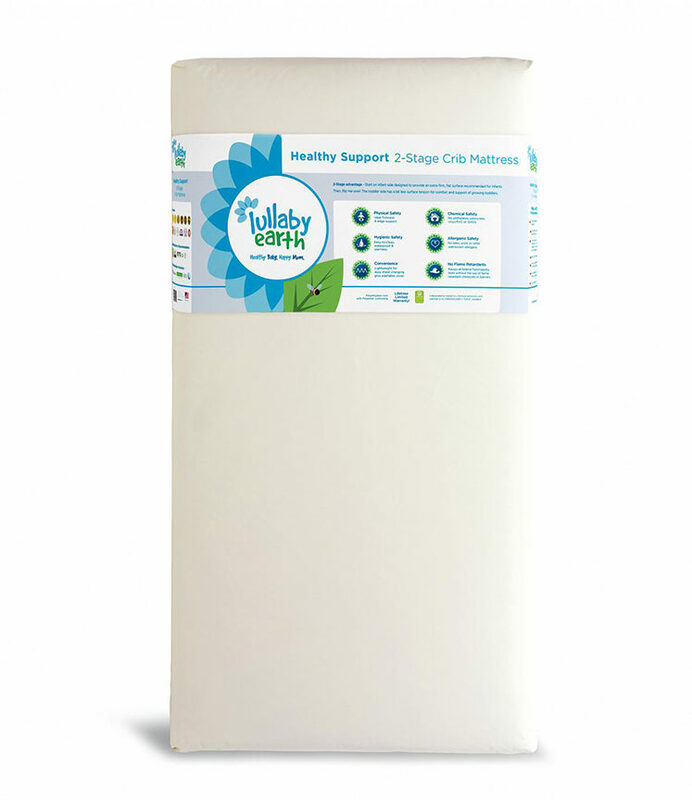 Designed to be easier for parents and safer for baby, the Lullaby Earth Healthy Support 2-Stage Crib Mattress offers a firmer side for infants and a cushion firm side for toddlers. Weighing a mere 7 pounds, it’s also a breeze to change the sheets. 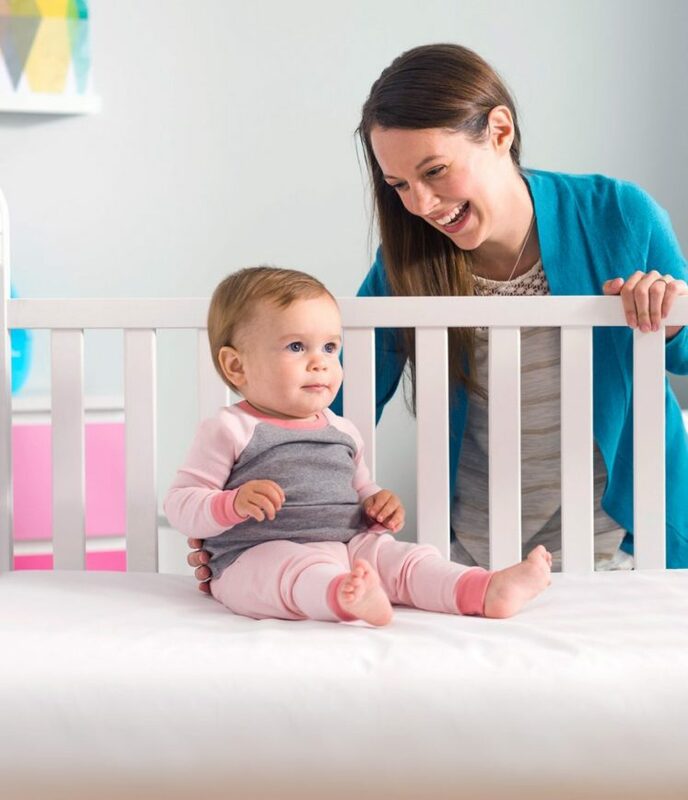 It features a waterproof design (even on the edges where most crib mattresses have seams), a firm and durable construction, square corners for a snug fit, and of course, no harmful chemicals or allergens. Meets the strictest GREENGUARD® certification standards for eliminating chemical emissions. Measures 27.5″ x 52″ x 6″ and comes with a lifetime limited warranty. 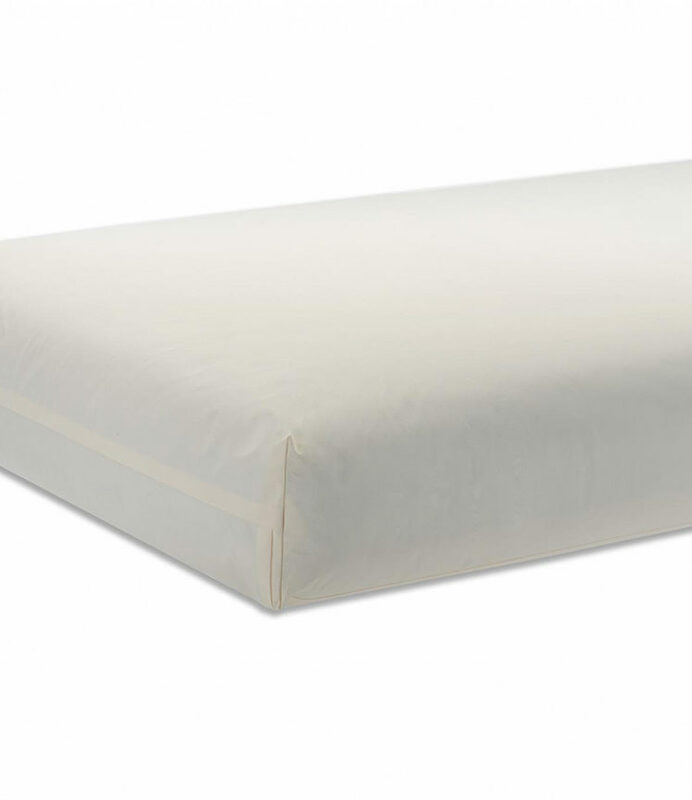 Proudly made in the U.S.A.
Changing the sheets on a heavy crib mattress can be a challenge. 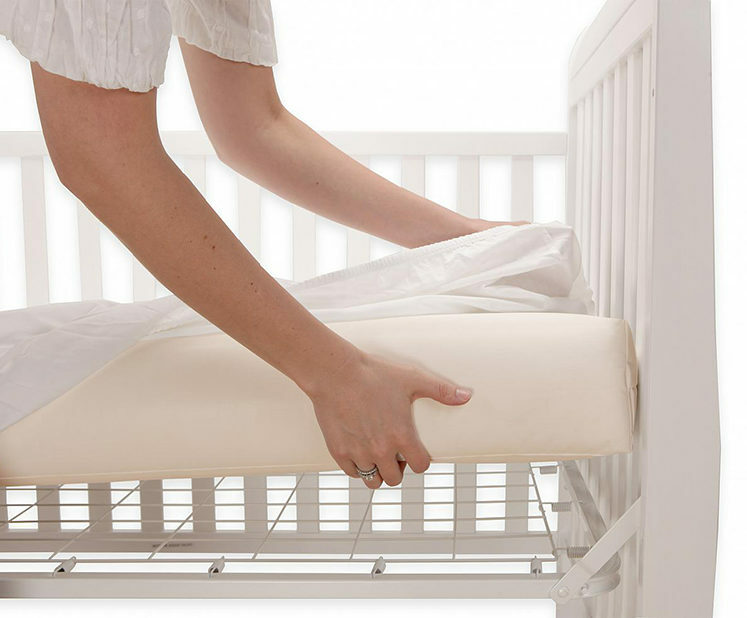 The Healthy Support 2-Stage Crib Mattress makes changing the sheets a breeze! Since it’s only seven pounds, you can get the job done easily, and it’s no hassle to give your baby a clean crib. Lullaby Earth crib mattresses are truly waterproof (unlike many “water resistant” models). They are even waterproof on the edges where most crib mattresses have seams. Just wipe up any mess with regular soap and water and you are good to go! A waterproof mattress makes for a more hygienic crib environment. By keeping fluids out of the mattress, there is a lower likelihood of mold or mildew growth. The waterproof surface doubly functions as a dust mite / bed bug barrier and is so pure it meets food contact standards! Firmness is one of the most important features in a crib mattress. The Lullaby Earth 2-Stage crib mattress offers the best of both worlds – a firmer side for infants, and a cushion firm side for toddlers. In addition, strong side and edge support adds structural stability and makes the Lullaby Earth mattress an excellent choice for toddler beds. Even in very small amounts, chemicals can have a negative effect on a baby’s development. 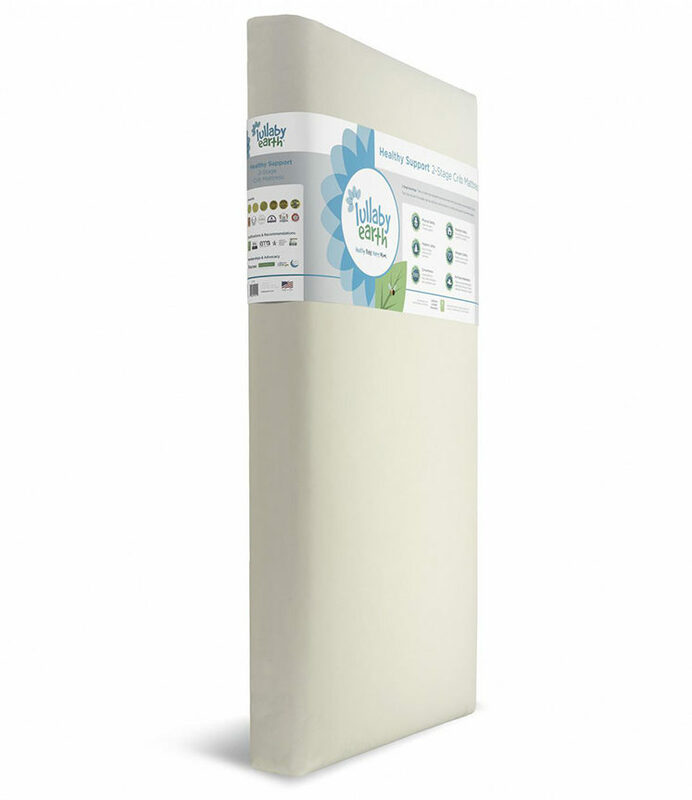 The Lullaby Earth crib mattress was designed to be free from harmful chemicals and allergens. Just to be sure, they are tested for chemical emissions and meet the strictest level of certification: GREENGUARD Gold. They completely avoid polyurethane foam (including eco/soybean foam blends) as well as conventional fabrics such as vinyl/PVC, urethane coated nylon and PFC treated damask. Measures 27.5 x 52 x 6 with square corners. Lifetime limited warranty. Proudly made in the U.S.A.